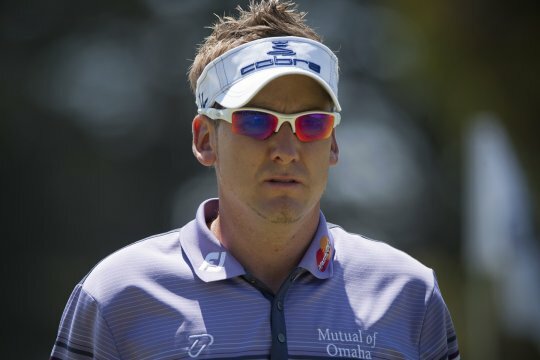 Ian Poulter shot a two-under 69 in the second round of the JBWere Masters in Melbourne to be at 9-under-par and a two-stroke lead over Australia’s Matthew Giles. Giles briefly held the second round lead at 7-under-par after firing a 3-under-par 68 to build on his opening round of 68. Ashley Hall remains a further shot back in third place after rounds of 66-77 to be at six under par. Poulter has indicated that he entered this event with the purpose of breaking inside the world top-20. The presence of world number one, Luke Donald, improves the tournament’s ranking. While his current 28th world ranking guarantees starts in all the 2012 elite fields, a win in Melbourne would propel Poulter to 17th and lucrative sponsor incentives based on performances on the US and European tours. Donald is currently at 3-under-par after rounds of 69-70 to be in a share of 14th position. Poulter birdied the final two holes to take the lead from Giles in a round he later described as being patchy. “It’s a tricky golf course,” said Poulter. Brendan Jones, Nathan Green, Brent McCullough, Kieran Pratt, Geoff Ogilvy and Peter Lonard are all at 5-under-par and in a tie for fourth position. Greg Chalmers is at 3-under-par following rounds of 69-70 and trying to become the second player to complete the Australian Triple Crown after sweeping the Australian Open and Australian PGA last month. The last player to achieve the triple crown was Robert Allenby in 2005. Defending champion Stuart Appleby withdrew from the event prior to the start of round two due to a back injury.